Visitors to the Masjid in 2014 and before has shared with us their thoughts after the visit. Some of their comments and their photos can be seen below. Comments from Visitors 2015 and before can be seen here. It was good for me to visit the Masjid Nagoya, and to talk with Japanese Muslims. I had an idea that “Islam is danger,” but the visit changed my view of Islam and Muslims. First of all, I was surprised at truth. For example, they don’t invitation to people, the word in my textbook for junior high school was incorrect and they are so friendly to others. Second, I was interested in their habits. Japanese people present money or goods in weddings, but Muslims present gold itself. I especially felt funny what the woman said: “gold doesn’t betray.” I think the word is really correct. Finally, I was impressed with their views that rich people should help the poor. It is not easy, so I admire that. I think more people have to understand Islam and Muslims. I was surprised the differences between my own life and Muslim women’s lives. I have had not a good image of Islam since what happened on 9/11. But now I can understand Islam. Islam doesn’t do sexual discrimination. The reason women hide their skin was understandable. I thought that Islam is frightening religion before I visit the Masjid Nagoya. I understood this thinking is not good, but I thought so. 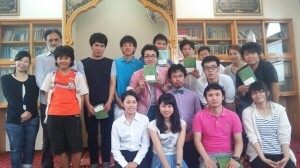 When we visited Masjid Nagoya, people who are in Masjid Nagoya are very kind and they taught us many things about Islam. When I heard their talks, I noticed that my thinking is wrong. Islam is not frightening religion. My thinking is changed. Visiting Masjid Nagoya is good experience for me. I hope that Japan changed comfortable for Muslim to live in. I felt mood of foreign country in the Masjid Nagoya. I learned about Islam at class last year. I understood about Islam. 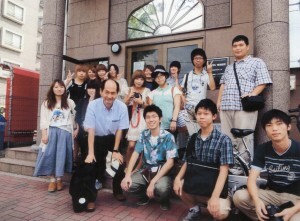 I have an image “scary” for Islam, but I met Japanese Muslim, and I disappeared to my Islam image. Before I visited Masjid Nagoya, I had thought Islam is fearful and very strict religion. However, I could know these ideas were completely misunderstanding after visiting. I thought the biased view to Islam are created by some media. I thought Muslim is no Japanese before we went to Masjid. But I met two Japanese women. They were different my image about Muslim. At first I thought Muslim is scary but people of Masjid Nagoya was very kind. And I didn’t know Muslim’s life is hard in Japan. They can’t found halal food easy. I don’t think that. I and my friend went to Halal Shop that one of Muslim Japanese women open. She does many international activity. I was surprised. I knew many things before I went to mosque. I had a very good time. My image of Islam before we went to mosque was so strict and women couldn’t be respected by men. While man could be respected by women. However, the image was incorrect. Man is so kind to woman.